The Environmental Investigation Agency was born out of a ground-breaking whaling investigation and, almost three-and-a-half decades later, our Ocean work remains a central pillar of what we do. 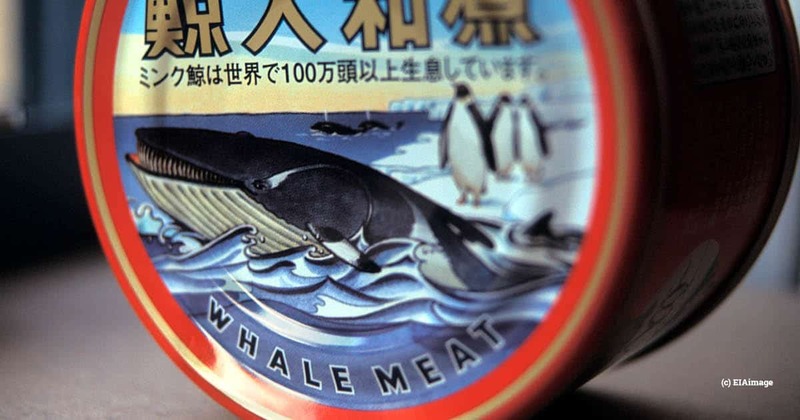 In that time, our investigators have been threatened by irate whalers, revealed human health risks from eating whales, porpoises and dolphin (collectively known as cetaceans), investigated Japan’s small cetacean hunts, dramatically reduced market availability of and demand for their meat and we have highlighted threats from chemical, sound and plastic pollution. 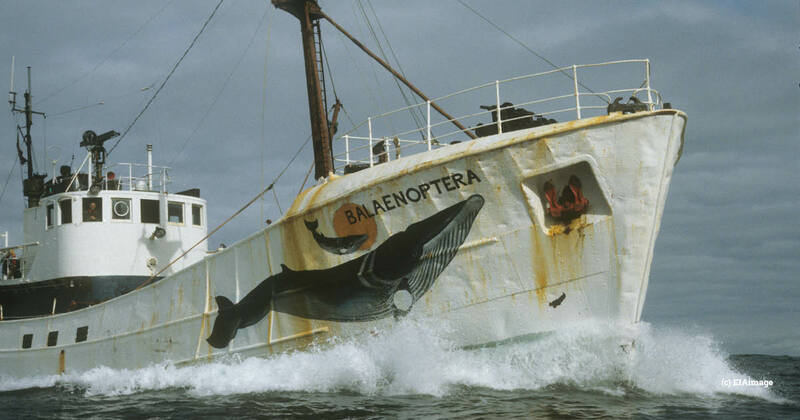 It all began in 1983 when a refitted North Sea fishing trawler, renamed Balaenoptera, set out for northern Norway to document the country’s minke whale hunts, including the use of the banned cold harpoon – harpoons with no detonating device which result in a longer, more agonising death. Allan Thornton put the expedition together and among the volunteer crew were Dave Currey and Jennifer Lonsdale. The expedition’s harrowing first-hand footage of whale hunts contributed to Norway’s whaling quota being cut by two-thirds and the end of its use of cold harpoons. The three resolved to continue to work together and so created EIA. A year later, Currey and Lonsdale travelled in an old camper van to the Faroe Islands to observe its pilot whale hunts, or grindadráp as they are called locally. 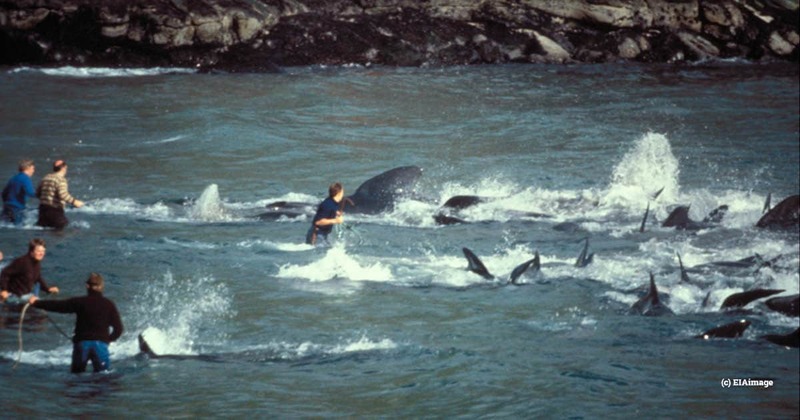 Shocking documentation of the Faroese slaughtering whales in the blood-stained shallow waters of bays into which they had been driven spurred an international outcry and EIA’s first major campaign. Looking at how much had been achieved with relatively little, our three founders realised they had in their hands a powerful new tool for effective campaigning – on-the-ground documentary investigation. Since those days, we have established a long history of campaigning for better protection for the ‘forgotten’ whales – the 70 or so smaller cetacean species which were not protected by the 1986 international moratorium on whaling. We have campaigned to stop the unsustainable Dall’s porpoise hand harpoon hunt, the largest cetacean hunt in the world until our efforts resulted in its drastic curtailment; we have exposed the dolphin drive hunts in Japan and were the first to bring the notorious Taiji hunts to the attention of the international media; we have investigated and exposed the large-scale slaughter of small cetaceans; and we have consistently revealed sales of toxic small cetacean food products. Our tireless campaigning has significantly reduced market demand for whale, dolphin and porpoise products in Japan, first by persuading more than 3,500 supermarkets to stop selling and marketing cetacean products and later successfully taking the fight to the key online marketplaces of Amazon Japan, Google and Rakuten. Our campaigns also took Japan’s three main fishing companies – Nippon Suisan, Kyokuyo and Maruha – permanently out of the whaling business. We have unswervingly campaigned at the International Whaling Commission (IWC) to maintain and strengthen the commercial whaling moratorium that provides vital protection for great whales. With a combination of credible scientific research, multiple reports and advocacy over more than 30 years, we have continued to highlight the increasing human threats to cetaceans and have been a key force in expanding the IWC’s work to address them. In recent years, we have investigated and exposed Icelandic whaling driven by multi-millionaire Kristján Loftsson and his company Hvalur, revealing the scale of the hunts and exports of the meat and blubber to Japan – unfortunately due to resume this summer after a two-year hiatus – and we continue to call out Japan’s sham ‘scientific’ whaling in the Antarctic and North Pacific. Bycatch is one of the most pressing threats to marine species, with hundreds of thousands of cetaceans dying every year in fishing gear. In addition to our work on the perilously endangered vaquita porpoise in Mexico, which numbers fewer than 30 individuals and is being killed in illegal gillnets set for the endangered totoaba fish, we are campaigning to strengthen EU and UK measures to address bycatch. What was originally a cetaceans campaign has in recent years expanded significantly to address broader marine issues concerning the health of the environments in which these magnificent creatures live, especially the problem of marine plastic pollution. We first drew attention to the issue of marine plastic pollution in 2001 through our work assessing global threats to whales, dolphins and porpoises and, via scientific papers and reports to the IWC, have contributed to that organisation’s work to address marine litter. We became more active on plastics at the legislative level in 2013, with our work on plastic bags helping to secure measures to reduce use of plastic carrier bags in the UK and Europe. In 2016, we formed the Microbead Coalition with Fauna & Flora International, Greenpeace UK and Marine Conservation Society, successfully campaigning for the UK Government to adopt a world-leading ban on microbeads in cosmetics and personal care products which will prevent countless billions of microplastic particles entering our seas every day. As part of the Rethink Plastic Alliance, we have helped strengthen EU legislation on plastics and waste. 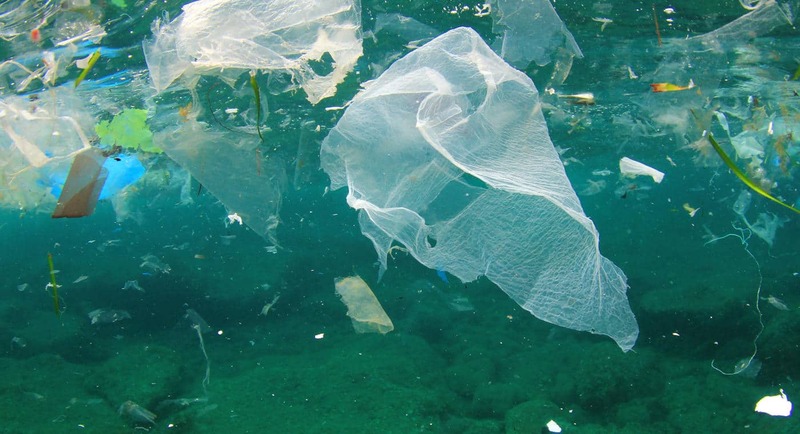 Internationally, we are a founding member of the #BreakFreeFromPlastic movement, working to secure the adoption of a UN initiative to tackle marine plastic pollution at a global level. From plastic pollution to the commercial exploitation of cetaceans and much in between, our planet’s blue world faces a number of grave threats. Our own experience of some 35 years of campaigns and investigations is that the solutions exist – and that a small organisation with dedication and clear goals can make a world of difference.